Zendesk is a customer service software company based in San Francisco, California. It was founded in 2007 by Mikkel Svane, Morten Primdahl and Alexander Aghassipour in Copenhagen, Denmark. Zendesk has been a publicly-traded company since 2014 and has offices in major cities around the world. Written in Ruby on Rails, the software is notable for its ability to integrate with a wide array of contact management systems, CRMs and web apps. Zendesk has made numerous acquisitions all aimed towards enabling companies to provide superior customer service for modern consumers. In 2015, Zendesk rolled out Satisfaction Prediction, a predictive analytics feature intended to isolate which actions during the customer journey are most likely to impact customer satisfaction. Zendesk has won numerous accolades for innovation. In addition, they’ve launched a philanthropic initiative, called the Neighbor Foundation, in several cities to promote charities and counteract social issues, such as poverty, homelessness, illiteracy and unemployment. 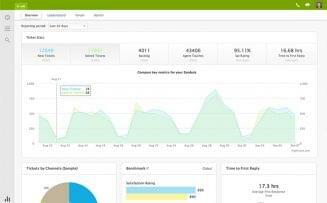 Zendesk offers five subscription plans which can be billed monthly or annually. All plans offer certain features available as paid add-ons. The following chart indicates features included or available as purchasable add-ons in out-of-the-box Zendesk subscriptions. It doesn’t include features obtained through the extension marketplace. Zendesk made a splash in the customer service software industry when it was released in 2007. Customer service had grown from call centers in the 90s to online chat in the 2000s, but service quality was conditional on the ability and consistency of individual agents, the capacity of service software to handle and process workload as well as the platform’s ability to efficiently track performance and ticket attributes. Zendesk was built to address these shortfalls and others in the customer service realm. It has gone through multiple iterations since its 2007 release, and spawned a host of imitators – some more successful than others – but continues to lead the helpdesk software industry in terms of helpdesk management, multichannel integration, customer satisfaction measurement innovation and data security. And this doesn’t include their army of free and paid add-ons accessible through their marketplace. There’s plenty that Zendesk makes convenient for its users. Email, Facebook and Twitter and the web widget are easily integrated. Connecting an email account will automatically turn received emails into tickets – users can also send emails to a specific helpdesk email address for automatic ticket creation. Replying from within the email account will update the helpdesk and reach the ticket sender. Interactions between agents and end users are automatically logged – this includes calls and instant messages. Multiple Facebook and Twitter accounts can be connected simply by navigating to their respective icons in the main dashboard and entering requisite login credentials. Creating the web widget is only a few clicks more, but equally simple; it requires activating the user’s Help Center, which they’ll use to build their customer-facing knowledge base and community forums. 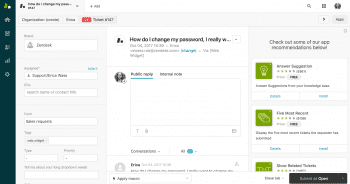 This also gives users a chance to set up their chat functionality, if included in their subscription, which allows agents to access their chat dashboard, with an activity feed for updates, tools to customize the web widget, analytics and real-time visitor tracking and helpdesk activity monitoring. 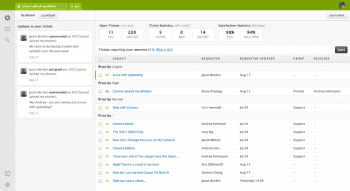 Zendesk gives agents plenty of ticket management tools. Admins can customize ticket fields, agents can create and share macros – automated responses – and receive tickets from various channels in a unified inbox. Tickets can be shared, reassigned, resolved; private notes added, ticket lists filtered in custom views, and potential agent collision (multiple agents working on the same ticket) detected. However, Zendesk doesn’t allow ticket splitting – so if end users raise another service issue within correspondence with an agent, a new ticket will need to be created – nor does it allow users to assume another agent’s identity. (This feature was disabled in the ‘new’ Zendesk released in 2015 for security reasons.) Moreover, Zendesk doesn’t automatically refresh ticket views – users must manually press the refresh button within the platform. It’s not hard at all, but it shouldn’t be hard to implement; one wonders why a helpdesk that otherwise dots its i’s and crosses its t’s would opt not to include a simple but useful feature. Some of these shortcomings can be somewhat resolved through extensions; a quick search through Zendesk’s community forums finds a partial workaround for the lack of ticket splitting functionality. Game mechanics, a notable feature of many rival helpdesks which is lacking in Zendesk’s out-of-box subscriptions, can be added the same way. 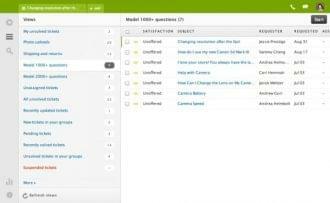 Zendesk doesn’t really come into its own until the Professional plan, when users get SLA management, customer satisfaction ratings, custom reports, community forums in multiple languages and phone support. It’s not cheap, and might cost more with paid add-ons you feel are necessary, such as live chat or telephony. But for the price you’ll get one of the most robust helpdesk solutions on the market with more data security assurances than their biggest competitors. (For a higher price, you can even have the Zendesk team implement the solution for you.) Zendesk was first on the scene with this type of customer service solution and they’ve continued to innovate; in 2016, they rolled out a machine learning, predictive analytics platform to estimate when and how customers’ satisfaction is most receptive to influence. With their robust features and expansive add-on marketplace, Zendesk continues to push the envelope for their users – while agents occasionally bump up against the surprising absence of a simple yet useful function, there’s far more in the Zendesk package that promises to increase companies’ potential to offer timely, responsive, and personalized customer service above and beyond what modern consumers have come to expect. What Do You Think of Zendesk?